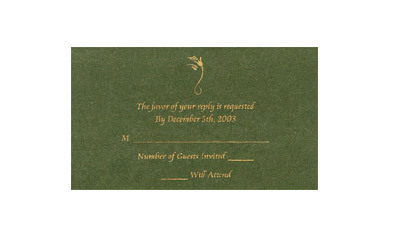 Wedding RSVP card or wedding response cards as are generally termed basically mean “Please Reply”. Our section provides you with wedding reply cards, rsvp invitations and assists you for selection the right RSVP wordings and wedding response card wordings. 'What does RSVP mean?’ This is a common question. RSVP is an abbreviation of the French phrase “Repondez S'il Vous Plait”. When a RSVP invitation is sent, it denotes that the receiver should send his confirmation or regrets regarding his attendance in the ceremony so that sender can make proper arrangements for the expected number of guests. Another commonly asked question is “What does RSVP Regrets Only on an invitation imply?” RSVP Regrets Only means that the person extending the invitation expects you to attend the function. If you plan to attend, you need not respond. However, if you do not plan to attend, you should respond and give your "regrets." It is not necessary to explain why you will not be attending.